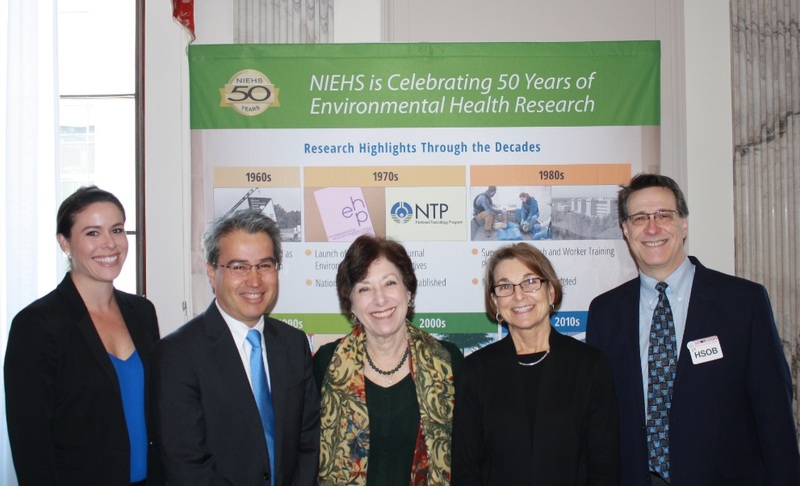 On Nov. 16, the ATS and partner organizations in the Friends of the National Institute of Environmental Health Sciences (NIEHS) convened a series of events on Capitol Hill to commemorate the 50th anniversary of the Institute. An educational briefing for congressional staff, Marking 50 Years of Connecting Environmental Health Research to Community Needs, was held in the U.S. Senate. The briefing included presentations on neurobehavioral effects of pesticide and heavy metals exposures, including lead and the broad health effects of air pollution. Speakers included NIEHS Director Linda Birnbaum, PhD; Sarah Ervin of the Honest Company, which produces safe, non-toxic consumer products; ATS member and Interim Dean of the University of Washington School of Public Health, Joel Kaufman, MD; Virginia Rauh, ScD, director of neurodevelopmental studies at the Columbia Center for Children's Environmental Health; and Robert Wright, MD, chair of environmental medicine at Icahn School of Medicine at Mt. Sinai, NY. One of the key themes of the event was the need to support NIH funding to ensure continued scientific discovery in environmental health that translate to public health advancements. In the evening, the Friends of NIEHS organized an honorary congressional reception to celebrate the NIEHS anniversary with members of Congress. The event was hosted by NIH Deputy Director Lawrence Tabak, DDS and featured remarks from NIEHS Director Linda Birnbaum, former NIEHS Director Kenneth Olden, PhD and Representatives David E. Price (D-NC), G.K. Butterfield (D-NC), House Appropriations Committee Ranking Member Rep. Nita Lowey (D-NY), Interior-Environment Ranking Member Rep. Betty McCollum (D-MN) and Rep. Lois Capps (D-CA). Additionally, Reps.Walter Jones (R-NC) and Rep. Charlie Dent (R-PA) attended the well-received event as well as many partner organization representatives, congressional staff and NIH staff. All of the members of Congress congratulated the NIEHS leadership on decades of scientific accomplishments and pledged continued support for both the Institute and the NIH's budget overall.